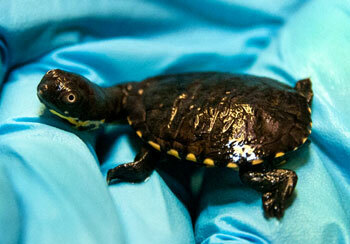 After a 123-day incubation period, a Roti Island snake-necked turtle hatched September 2, 2013, at the Milwaukee County Zoo. 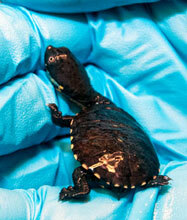 Although the Milwaukee County Zoo has bred common snake-necked turtles since the 1980s, this is the first hatchling of a Roti Island snake-necked turtle at our facility. The hatchling was the sole survivor from a 10-egg clutch obtained from a female that recently arrived from the Fort Worth Zoo in Texas. The Roti Island snake-necked turtle is one of the most endangered turtles in the world mainly due to threats from humans that collect the species for the pet trade. The species is part of the Association of Zoos and Aquariums Species Survival Plan (SSP) that joins groups of scientists and collaborating experts to develop breeding plans that protect the genetic variation of species. These plans improve the survival of endangered species in our collection and in the wild. In the wild, Roti Island snake-necked turtles live exclusively in a 70-square-kilometer area in eastern Indonesia on Roti Island, in fresh water swamps and lakes. They eat small fish, tadpoles, insects and water plants. Roti Island snake-necked turtles belong to a group of turtles known as side-necked turtles, that fold their necks in sideways, as opposed to most other turtles that pull their necks straight back into their shells.